CINCINNATI -- A worker carefully peels tape off of patches of yellow paint to reveal a honeycomb design on the side of the trailer. Complete with painted blades of grass and a cutout window, the former shipping unit is ready for its debut as Findlay Market’s newest farm stand. The Evanston farm stand opened Thursday, making it the third Findlay Market farm stand in the Greater Cincinnati area. 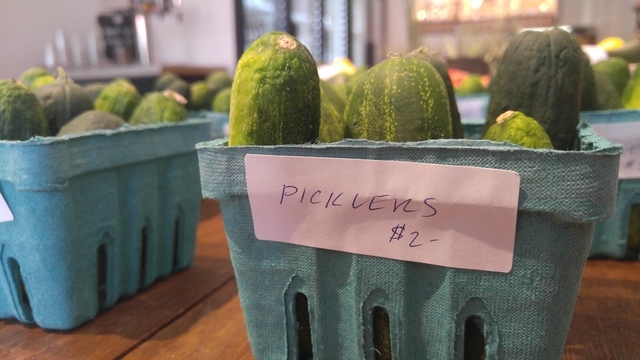 Like the other farm stands in Price Hill and Walnut Hills, the Evanston farm stand provides locally grown and sourced products to the community. From fresh fruits and vegetables to honey and jellies to farm fresh eggs, each farm stand carries different products depending on the neighborhood and the demand. No one knows how to provide different products quite like Tristan Crigger. As the Local Food Program Manager for Findlay Market, Crigger is responsible for launching and managing all three farm stands, as well as mapping out locations for new sites. Crigger said several farmers make special deliveries to the farm stands during the week to bring the freshest produce to the community. Additional products are pulled from Findlay’s store, Dirt: A Modern Market. No matter what the stand supplies, whether it be produce or chips and salsa, everything must be sourced from within the community. Kelly Lanser, Communications Manager for Findlay Market, said the support of Evanston has been instrumental in getting the farm stand up and running. Crigger mentioned Xavier University and the Evanston Community Council have been particularly supportive. He said marketing and communication classes at Xavier did research on the area for class projects, and he used the information to derive marketing, communication and branding ideas. Crigger also said he is grateful for Port of Greater Cincinnati Development Authority, as they provided the land for the farm stand, which was acquired through funding from the city. Councilmember Yvette Simpson said she has a very close relationship with those at Findlay Market, and she is deeply supportive of their effort to provide Evanston with fresh, local products. “In areas like Evanston, where we have a high concentration of low income individuals who may not have access to either transportation and/or quality, fresh fruits and vegetables, I think it’s a great model,” Simpson said. Lanser said she is excited to see the final result of over a year’s work with the Evanston community. Crigger said local products not only increase health and wellbeing, they also benefit the economy. Lanser hopes the farm stand will offer much more than food to the community. Additionally, Lanser hopes the farm stands help educate shoppers when to buy certain produce items based on the season. The farm stand will also accept electronic benefits transfer cards, and they have a program for shoppers to maximize their spending. The program, Produce Perks, provides two-for-one incentive tokens. Crigger explained that shoppers who want to draw from their EBT card are given coins in return that can be spent at Findlay Market or any of the farm stands. The program also matches the first $10. The Produce Perks program is in place to alleviate the higher cost of buying local products. “I think that the mission of the farm stand accomplishes two things. We provide local, fresh produce and goods to a community that may not have access to it, and through the education process, we teach them how to utilize that, and through programs like Produce Perks, how to afford it,” Crigger said. He hopes the program will promote local products. Crigger said the grand opening Thursday was an opportunity to thank the community and everyone who was involved in making the farm stand a reality. “We want to say thank you, but we’re also ready to roll up our sleeves and service the community,” Crigger said. The Evanston farm stand is open 3 p.m.- 6 p.m. every Thursday through October at 1614 Hewitt Avenue, Cincinnati, Ohio.